We all know that most MCUs we use for our projects are time-agnostic; simply put they are unaware of the time around them. It’s OK for most of our projects but once in a while when you come across an idea where keeping time is a prime concern, DS3231 Precision RTC module is a savior. It’s perfect for projects containing data-logging, clock-building, time stamping, timers and alarms. At the heart of the module is a low-cost, extremely accurate RTC chip from Maxim – DS3231. 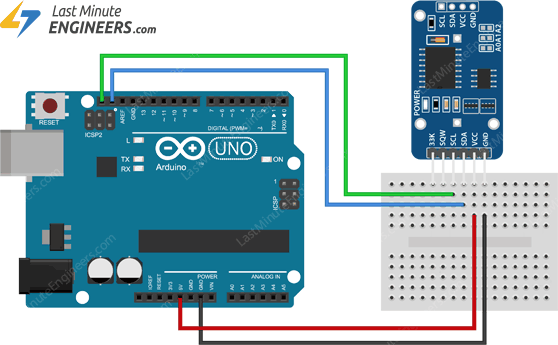 It manages all timekeeping functions and features a simple two-wire I2C interface which can be easily interfaced with any microcontroller of your choice. The chip maintains seconds, minutes, hours, day, date, month, and year information. The date at the end of the month is automatically adjusted for months with fewer than 31 days, including corrections for leap year (valid up to 2100). The clock operates in either the 24-hour or 12-hour format with an AM/PM indicator. It also provides two programmable time-of-day alarms. The other cool feature of this board comes with SQW pin, which outputs a nice square wave at either 1Hz, 4kHz, 8kHz or 32kHz and can be handled programmatically. This can further be used as an interrupt due to alarm condition in many time-based applications. Most RTC modules come with an external 32kHz crystal for time-keeping. But the problem with these crystals is that external temperature can affect their oscillation frequency. This change in frequency can be negligible but it surely adds up. 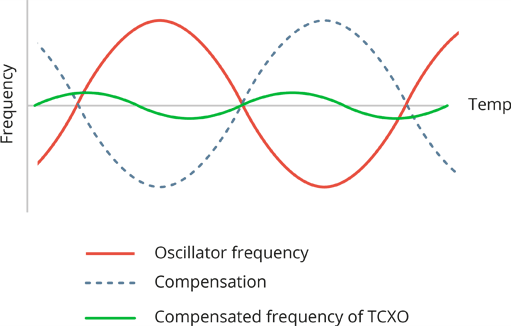 To avoid such slight drifts in crystal, DS3231 is driven by a 32kHz temperature compensated crystal oscillator (TCXO). It’s highly immune to the external temperature changes. TCXO is packaged inside the RTC chip, making the whole package bulky. Right next to the integrated crystal is a temperature sensor. This sensor compensates the frequency changes by adding or removing clock ticks so that the timekeeping stays on track. That’s the reason TCXO provides a stable and accurate reference clock, and maintains the RTC to within ±2 minutes per year accuracy. The main difference between the DS3231 and DS1370 is the accuracy of time-keeping. DS1307 comes with an external 32kHz crystal for time-keeping whose oscillation frequency is easily affected by external temperature. This usually results with the clock being off by around five or so minutes per month. However, the DS3231 is much more accurate, as it comes with an internal Temperature Compensated Crystal Oscillator(TCXO) which isn’t affected by temperature, making it accurate down to a few minutes per year at the most. DS1307 is still a great value RTC and serves you well, but for projects that require more accurate time-keeping, DS3231 is recommended. The DS3231 incorporates a battery input, and maintains accurate timekeeping when main power to the device is interrupted. 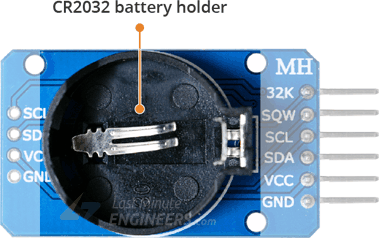 Assuming a fully charged CR2032 battery with capacity 220mAh is used and chip consumes its minimum 3µA, the battey can keep the RTC running for a minimum of 8 years without an external 5V power supply. 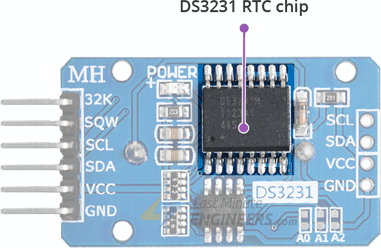 DS3231 RTC module also comes with a 32 bytes 24C32 EEPROM chip from Atmel having unlimited read-write cycles. It can be used to save settings or really anything. 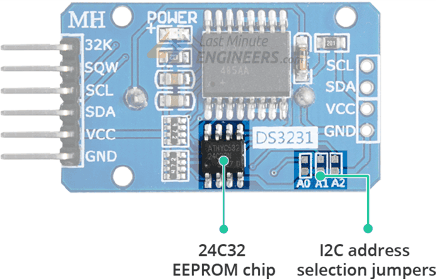 The 24C32 EEPROM uses I2C interface for communication and shares the same I2C bus as DS3231. 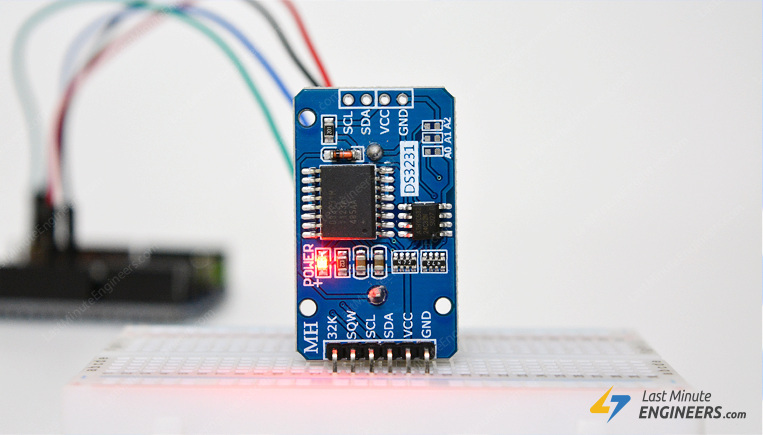 The I2C address of the EEPROM can be changed easily with the three A0, A1 and A2 solder jumpers at the back. Each one of these is used to hardcode in the address. If a jumper is shorted with solder, that sets the address. As per the 24C32’s datasheet, these 3 bits are placed at the end of the 7-bit I2C address, just before the Read/Write bit. As there are 3 address inputs, which can take 2 states, either HIGH/LOW, we can therefore create 8 (23) different combinations(addresses). By default, all the 3 address inputs are pulled HIGH using onboard pullups, giving 24C32 a default I2C address of 1010111Binary or 0x57Hex. By shorting the solder jumpers, the address inputs are puled LOW. It allows you to set the I2C address according to below table. 32K pin outputs the stable(temperature compensated) and accurate reference clock. SQW pin outputs a nice square wave at either 1Hz, 4kHz, 8kHz or 32kHz and can be handled programmatically. This can further be used as an interrupt due to alarm condition in many time-based applications. 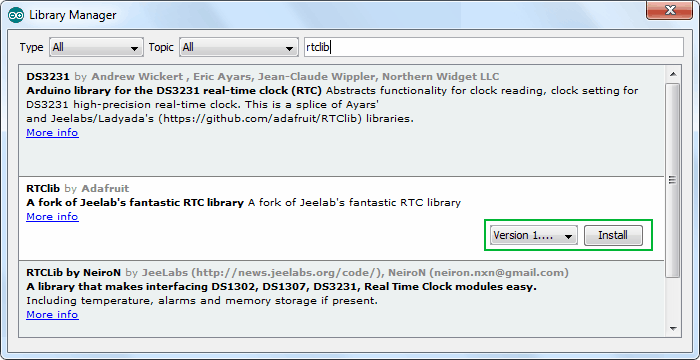 The following sketch will give you complete understanding on how to set/read date & time on DS3231 RTC module and can serve as the basis for more practical experiments and projects. 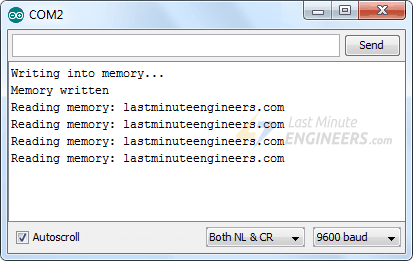 lostPower() function reads the DS3231’s internal I2C registers to check if the chip has lost track of time. 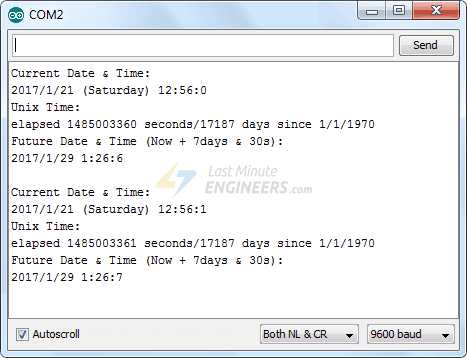 If the function returns true, we can then set the date & time. With DS3231 RTC module, as a bonus, you get 32 bytes of Electrically Erasable ROM. Its contents will not be erased even if main power to the device is interrupted.